Son of Dr Antonio Fusco, a pharmacist, and Stella Giordano, an Italian noble; seventh of eight children in a pious family. His mother died of cholera in 1837 when Tommaso was six, his father in 1841 when the boy was ten, and he was educated by his fraternal uncle Giuseppe, a priest and school teacher. Entered the seminary at Nocera, Italy in 1847, the same year his uncle Giuseppe died. Ordained on 22 December 1855. Opened a school for boys in his own home, and organized prayer groups at night in his parish. Joined the Congregation of the Missionaries of Nocera in 1857, and became a travelling missionary in southern Italy. Chaplain and spiritual director at the Shrine of Our Lady of Carmel (Our Lady of the Hens) in Pagani, Italy in 1860. Opened a school of moral theology in his home in 1862, and trained priests in the ministry of Confession. Founded the Priestly Society of the Catholic Apostolate to support missions, a congregation that received the approval of Pope Blessed Pius IX in 1874. Founded the Daughters of Charity of the Most Precious Blood on 6 January 1873, a congregation devoted to the care of orphans. Parish priest at San Felice e Corpo di Cristo at Pagani from 1874 to 1887. Confessor to cloistered nuns at Pagani and Nocera. Wrote on a number of topics including moral theology; his works always expressed his devotion to the Precious Blood. Late in life he was the victim of slander when a brother priest became jealous of Tommaso's good works and consequent notoriety. But Father Fusco prayed his way through the matter, continued his work, and was vindicated in the end. Raised in a pious, rural Italian farm family; his brother Jakob became a priest. Devotee of Blessed Antoine-Frédéric Ozanam and Saint Vincent de Paul. To follow their example, he joined the Saint Vincent de Paul Society in 1932, and by 1937 was the president of the Bolzano, Italy division. In addition to directly caring for the poor, he became a vocal spokesman for them. A member of Catholic Action, in 1934 he became the head of the organization in the diocese of Trent, Italy. Student of the writing of Saint Thomas More and Saint Thomas Aquinas, concentrating on their correspondence as he thought that letters would reveal the real men themselves. He joined the covert anti–Nazi group Andreas Hofer Bund in 1939. Married to Hildegard Straub on 26 May 1942; their son Alberto was born in 1943. Drafted into the German army in World War II, assigned to an SS unit in 1944, and sent to Prussia for training. On 4 October 1944 he announced that his faith prevented him from taking the oath of loyalty and obedience to Hitler, or of cooperating with the anti–Christian Nazi ideology. Imprisoned for his belief, Josef was sentenced in February 1945 to be executed in the Dachau concentration camp, he died while en route there. Martyr. Known as a pious child; Constantius once convinced his parents to pray with him for the healing of his terminally ill sister - and she was immediately cured. He joined the Dominicans at age 15 at the convent of Santa Lucia. Spiritual student of Blessed Laurence of Ripafratta, Blessed Corradino of Brescia and Saint Antoninus of Florence. Reforming prior of friars in the Italian cities of Florence, Fabriano, Perugia and Ascoli Piceno. Noted preacher and peacemaker in local disturbances; worked with Blessed Peitro da Mogliano and Saint James of the March. Known for his deep prayer life, as a miracle worker. and for his gift of prophecy; he miraculously knew the instant of the death of Saint Antoninus. He was considered a saint in life by all who knew him. Youngest of four children. Educated in the Saint Rose of Lima Dominican boarding school at Huesca, Spain where she became a Dominican nun in 1885, taking the name Ascensión. Teacher in 1886. In 1913 the Spanish state took over the school expelled the sisters. Missionary to Peru, arriving with eight others on 30 December 1913, teaching girls and caring for the poor and sick. Co-founded the Dominican Missionaries of the Rosary on 5 October 1918, and served the rest of her life as its first superior. Today the congregation has 785 missionaries in 21 nations. Son of Eormenric; great-grandson of Hengist, Saxon conqueror of Britain. Raised as a pagan worshipper of Odin. King of Kent in 560. 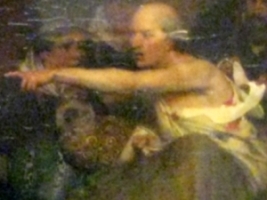 Defeated by Ceawlin of Wessex at the battle of Wimbledon in 568, ending his attempt to rule all of Britain. Married the Christian Bertha, daughter of Charibert, King of the Franks; they had three children, including Saint Ethelburgh of Kent. Convert to Christianity, baptized by Saint Augustine of Canterbury in 597; his example led to the baptism of 10,000 of his countrymen within a few months, and he supported Augustine in his missionary work with land, finances and influence. Issued the first written laws to the English people in 604. Born to a pious Christian family. Joined the Order of the Hermits of Saint Jerome in Migliarino, Italy at age 16. Known during his short life for the depth and intensity of his prayer life. Consecrated herself by a personal perpetual vow of chastity when a young woman. Very active in her parish life. Opened a school for girls in her own home where she taught needlework and prayer. Member of the Third Order Secular of Our Lady of Mount Carmel and Saint Teresa of Jesus. Great devotion for the Virgin Mary. Bishop of Rouen, France from 549, a position he held for 35 years. Because of his involvement in political intrigue, the French king had him brought before a court of bishops on a charge of fomenting rebellion. Praetextatus denied the charges, but agreed to exile for several years instead of execution. He was formally reinstalled as bishop by the Council of Macon. Praetextatus continued correcting the queen and preaching against the evil practices of her regime, encouraging the monarch to set a holy example. Instead, she had him assassinated. Monk in Caesarea, Cappadocia. May have been a priest; records are unclear. He was one of a group of Christians assembled and ordered to make a sacrifice to idols during the persecutions of Diocletian; when the sacrificial fire went out, Sergius immediately claimed it was the work of the true God. He was immediately "tried" and executed by order of the local governor. Martyr. Born to the nobility, the daughter of Emilia della Rovere and Arduino II, Count of Valperga; sister of the Blessed Arduino of Turin; aunt of Blessed Boniface of Aosta. Benedictine nun in Busano, Italy as a young woman. Later chosen abbess of her house; she used the position and family connections to repair and expand her convent. Had the gift of prophecy. 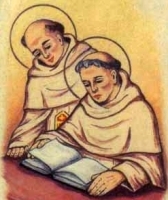 A cousin of Saint Peter Nolasco, Arnold joined the Mercedarians on the first day of their founding in the early 13th century, and lived in the monastery in Valencia, Spain. He helped spread interest in the Order and its work by explaining the virtues that develop from living the Order’s Rule. Bishop of Trier, Germany in 486 during a period of great political turmoil when the city came under the rule of the Franks. Brother of Saint Comman of Iona. Monk. Abbot of Iona, Scotland. Wrote a biography of Saint Columba of Iona. When a copy of Diocletian's edict against Christianity was posted in public, Evetius vandalized it. Martyr. Sixth century bishop of the Le Puy area of Gaul (modern Le Puy-en-Velay, France) based in the city of Ruessium (modern Saint-Paulien). Benedictine monk at the Abbey of Saint-Bertin, France. Abbot at Auchy, France. 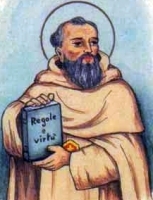 Abbot at Saint-Bertin in 1138. Married to Eberhard, Count of Spanheim. Widow. Benedictine nun at Bingen. Benedictine monk at Saint-Colombe abbey, Sens, France. Bishop of Auxerre, France in 889. An early martyr in Rome, Italy.